The Platinum Tools TCC200 Coax Clarifier Kit with 2 Coax RF Remotes includes the Coax Clarifier with 4 AA alkaline batteries, No. 1 and 2 Coax RF Remotes, No. 1 to 4 ID Only Coax Remote Set in a Foam Holder, 12” Screw-On Female-Jack to Push-On Female-Plug Cable Assembly, Female-Jack to BNC-Jack Adapter, 3 Female-Jack to Push-On Plug Adapters, 3 F81 Female Connector Couplers, 4 Female Terminator Plugs, and Hanging Storage Pouch. 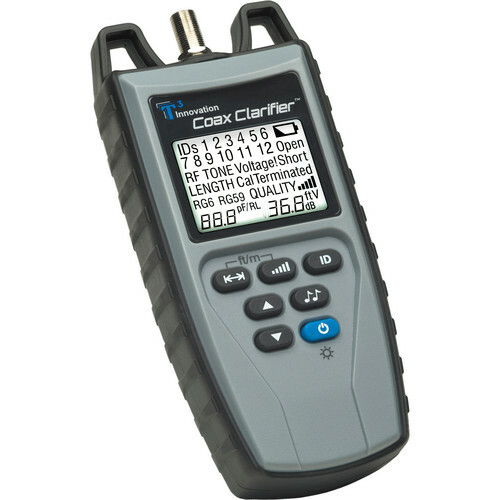 The included Coax Clarifier makes it easy to discern the layout of a dark coax network, locate faults on individual cable runs, identify remotes through splitters, and determine cable run lengths. Separate wire mapping sets allows mapping the entire coax system and measure the quality and network characterization for carrying high grade video, surveillance data and HD programming. Note: For best measurement accuracy, the cable network or individual splitter must be properly terminated. Use the included F-Terminator plug accessory to terminate unused connections. Box Dimensions (LxWxH) 13.0 x 5.6 x 3.3"